Almost 600 years ago some monks in the Belgian village of Hoegaarden, presumably after finishing monking for the day, decided to made some beer… and it was good. I like the Belgian witbier, particularly from the tap. A friend of mine at work stopped me in the hall the other day and asked if I felt like a few beers. I said sure. “Man, I mean… I have a few beers. A dude gave them to me and I’m not going to drink them, so I was wondering if you wanted them”. My mate is into working out and being healthy and whatnot, so I didn’t think much of this first ever (in my experience) re-gifting of beer. Then he dropped them over. He explained that this particular cherry-flavoured brew was released, for some reason, to celebrate the blooming of the cherry blossoms (a brief and much-loved time of year in Korea and Japan). As a kid I picked cherries on the local orchards for pocket money, and we celebrated cherry season by eating cherries. Beer, I would later discover, does just fine by itself. Now, this thoughtful gift from my friend (who I now understand might well be my enemy) was given last week, at the end of September. It didn’t immediately trigger that the cherry blossoms bloom in late March. These particular beers had apparently been on a six-month re-gifting world tour, looking for a final resting place, only to arrive back to Korea and inevitably, my fridge. I opened one after work. It tasted like cherries, and also beer… not great. The can actually advertises that it contains “Natural Cherry Juice & Cherry Blossom Aroma” (whatever that is)… and you can really taste it. Korean food is awesome, and I live near the epicenter of the world’s best of this. For some reason though, Korean attempts at non-Korean food remain random at best. 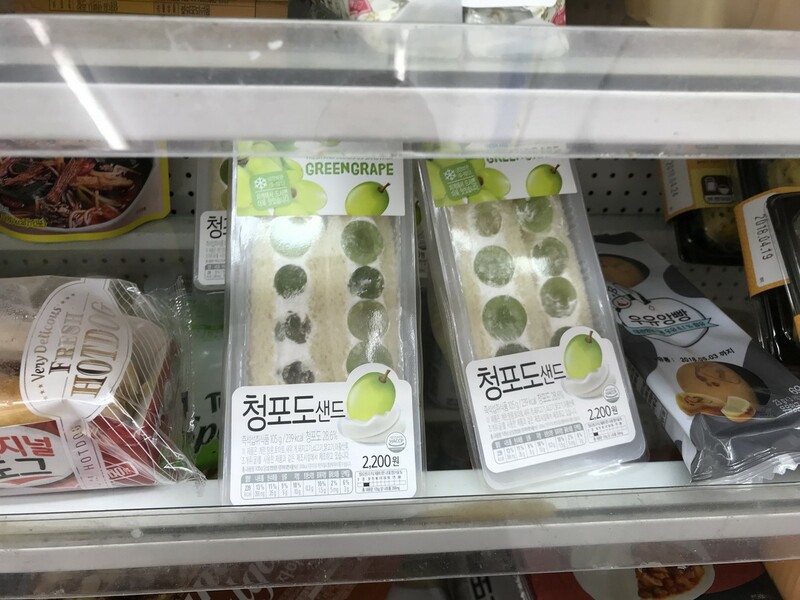 Convenience store fare… Green Grape Sandwich. Mmmmm. Food in Korea tends to be spicy or sweet. Savoury isn’t a thing. A Korean convenience store or bakery is not a magical place. Since the local food is amazing, I try not to analyse the inexplicable abominations sometimes called fusion, or a sandwich. Those beers are still here, by the way. I’ve had one. I think I might break a new personal best, being that of the amount of time beers have stayed in my fridge. Drop over for a cold one, if you like. Cheers. 2 Comments on "Things that Shouldn’t be…"